Whether it's a toasty mocha or iced tea you want to take along in your Ram Turbo Diesel, make sure your favorite beverage stays hot or cold at just the right temperature. 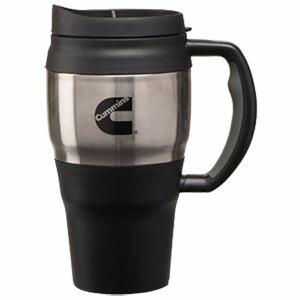 This travel mug is made of stainless steel with double-wall insulation and holds 20 ounces of your favorite drink. Sweat-proof, it also fits in your car's cup holder. Screen printed Cummins "C" logo center.